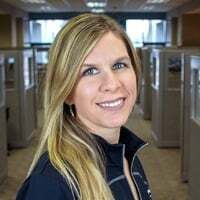 We get questions everyday from customers asking about CIP and COP systems, so we asked the team at Sani-Matic, an engineer, designer, and manufacturer of CIP and COP systems to answer some of the questions we're asked most. Here's what they had to say. 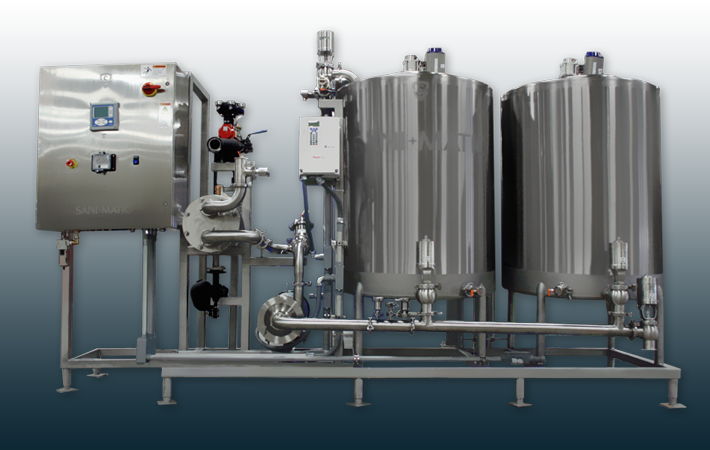 WHAT ARE THE DIFFERENCES BETWEEN SINGLE-TANK, 2-TANK, AND 3-TANK CIP SYSTEMS? 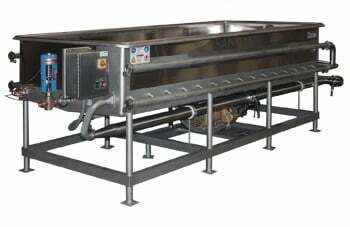 A single-tank (Single-use) Clean In Place system uses the pre-rinse cycle water, detergent wash, post rinse cycle water, and sanitize solution once and then sends each to the drain. Based on operating costs (costs of CIP chemicals, water, water disposal, steam, and time) a single-tank system costs the most to use and operate. 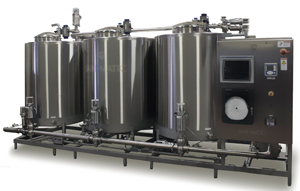 A single-tank CIP system may be appropriate if it is used infrequently. A 2-tank (Detergent Re-use) system recaptures the detergent wash solution at the end of each wash step. After making up the loss of water and detergent from the previous wash, it is reused for the next wash step. This often saves 85 to 90 percent of the water and detergent— and much of the steam (in the form of hot wash solution)— in an efficiently operating clean in place system compared to a 1-tank system. A 3-tank (Detergent and Rinse Re-use) system, pictured to the right, recaptures the detergent wash solution at the end of each wash step and the post rinse solution at the end of each post rinse step. The post rinse solution is used for the next pre-rinse step. This typically saves 100 percent of the fresh water that would have been used in this step compared to a single-tank or 2-tank CIP system. It also has the added benefit of typically being warmer and having some detergent carryover, which aid in pre-rinsing. 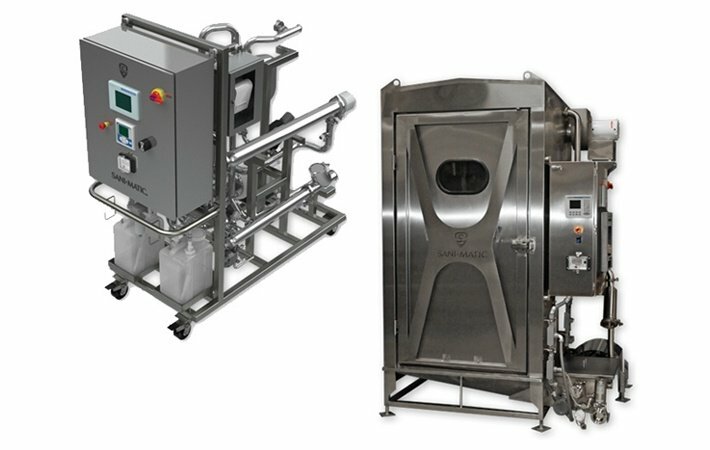 As with the 2-tank CIP system, there are significant savings in water, detergent and steam in a 3-tank CIP system compared to a single-tank system. IS THERE A "STANDARD" CLEAN IN PLACE SYSTEM? No. Each facility’s process is different, as are the utilities available. 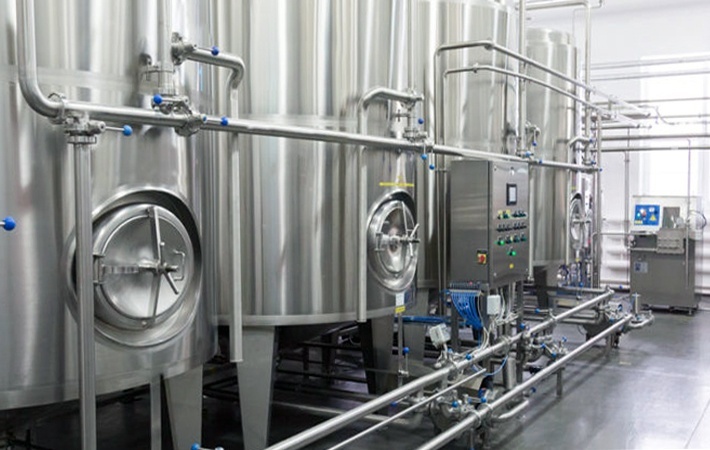 To provide a sanitary cleaning solution, the CIP system requires customization. CAN THE NEW CIP CONTROLS BE INTEGRATED INTO AN EXISTING PLANT CPU PROGRAM? Absolutely. You can choose to have the programming done for you by the system manufacturer's in-house engineers or, if your plant has programming capabilites, you can program the controls used in the CIP system yourself. Generally speaking, clean in place system skids can be customized with the specific programming controls your plant uses (i.e. Siemens, Allen-Bradley). CAN YOU CIP CONVEYOR BELTS? All applications are different and how to clean them depends greatly on the soils that need to be removed during the cleaning process. But, yes, you can CIP conveyor belts by installing spray bars over and/or under the conveyors. WHAT IS THE TYPICAL WASH TIME FOR A COP SYSTEM? A COP wash cycle length depends on the items you are washing and the soil type. However, most components can be washed in 20–30 minutes. HOW DO I DETERMINE WHAT SIZE COP WASHER I NEED FOR MY APPLICATION? What will you clean in the COP Washer? Parts, pipes, hoses? How big are the biggest parts that need to be cleaned? How long is the longest pipe and/or hose? How fragile are the parts? How many parts, pipes, and hoses will you need to wash in a given period of time? Review the answers to these questions so you may determine the correct COP tank size for your needs. For example, if all of your parts will fit into a 6-foot tank, with the exception of four hoses that are longer than 6-feet, you may want to stick with a 6-foot tank and wash the hoses by hand. Adding the extra feet onto your tank to accommodate only a few items will cost you more on the investment and in ongoing utility expenses. To learn about how to specify an efficient CIP system for your plant, refer to our eBook, The Plant Engineer's Guide to Specifying CIP Systems!